Graphene's hexagonal structure makes it an excellent lubricant. When trying to design a mechanical system to last as long as possible, scientists and engineers have to find ways of overcoming friction. While researchers have found many materials that help to reduce friction, conventional lubricants often have chemical limitations. A recent analysis at the U.S. Department of Energy's Argonne National Laboratory has identified the properties of a newer, exceptionally wear-resistant substance that works in a broader range of environments. Nanoscientist Anirudha Sumant and his colleagues at Argonne's Center for Nanoscale Materials and Argonne's Energy Systems division applied a one-atom-thick layer of graphene, a two-dimensional form of carbon, in between a steel ball and a steel disk. They found that just the single layer of graphene lasted for more than 6,500 "wear cycles," a dramatic improvement over conventional lubricants like graphite or molybdenum disulfide. "For comparison," Sumant said, "conventional lubricants would need about 1,000 layers to last for 1,000 wear cycles. That's a huge advantage in terms of cost savings with much better performance." Graphite has been used as an industrial lubricant for more than 40 years, but not without certain drawbacks, Sumant explained. "Graphite is limited by the fact that it really works only in humid environments. If you have a dry setting, it's not going to be nearly as effective," he said. Molybdenum disulfide, another common lubricant, has the reverse problem, Sumant said. It works in dry environments but not well in wet ones. "Essentially the challenge is to find a single all-purpose lubricant that works well for mechanical systems, no matter where they are," he said. Graphene's two-dimensional structure gives it a significant advantage. "The material is able to bond directly to the surface of the stainless steel ball, making it so perfectly even that even hydrogen atoms are not able to penetrate it," said Argonne materials scientist Ali Erdemir, a collaborator on the study who tested graphene-coated steel surfaces in his lab. 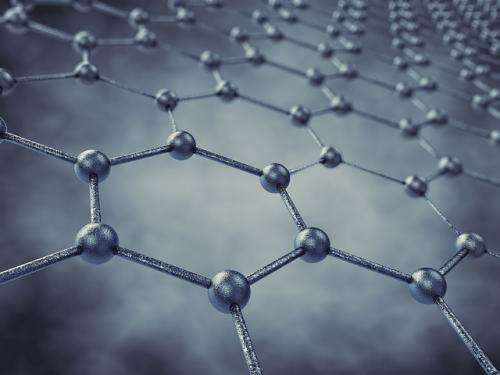 While doing so in an environment containing molecules of pure hydrogen, they observed a dramatic improvement in graphene's operational lifetime. When the graphene monolayer eventually starts to wear away, hydrogen atoms leap in to repair the lattice, like stitching a quilt back together. "Hydrogen can only get into the fabric where there is already an opening," said Subramanian Sankaranarayanan, an Argonne computational scientist and co-author in this study. This means the graphene layer stays intact longer. An article based on the research, "Extraordinary Macroscale Wear Resistance of One Atom Thick Graphene Layer," appeared in the Aug. 26 edition of Advanced Functional Materials. Argonne postdoctoral researchers Diana Berman and Sanket Deshmukh are other authors of this study.